Baltimore Maryland, home to over 30,000 vacant and abandoned lots and numerous economically disadvantaged neighborhoods, is also home to some of the most innovative job creation strategies and vacant lot reclamation projects in the nation. 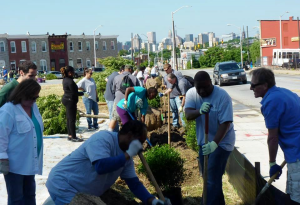 Through the Baltimore Urban Waters Partnership (BUWP), waterways are being cleaned up, communities are reconnecting with their urban waters, and abandoned lots are being transformed for community benefit. The BUWP is focused on the Patapsco Watershed, which flows to the Baltimore City Harbor and ultimately into the Chesapeake Bay. The watershed includes Maryland’s largest population area of approximately 650,000 people . The eastern portion of the Patapsco River is in a highly developed region and is subject to trash buildup and pollution from wet weather events. Recognizing a need in Baltimore to not only address water quality in the Patapsco watershed and access to Baltimore’s waterways, the City of Baltimore knew there was a need for community revitalization and the opportunity to capitalize on the social and economic benefits derived from improved urban waters and adjacent lands. The Baltimore Urban Waters Partnership, led by the USDA Forest Service’s Baltimore Field Station, is working to develop projects devoted to protecting and restoring urban waters; promoting community revitalization and strengthening the social fabric through the removal of blight, establishment of open spaces, and creation of economic development to serve as catalyst opportunities for disadvantaged neighborhoods. The BUWP was one of the original seven pilot communities selected in 2011 to be an Urban Waters Federal Partnership location. The Partnership is made up of approximately 60 partner agencies and, through the efforts of a partnership Ambassador, serves as the convener and planner of periodic meetings. The Baltimore team has developed a business model for coordination and collaboration and identified four sub‐teams to lead their collaborative efforts, each centered on local projects and led by local partners. Keys to success include the ability to identify projects that are realistic and long lasting and to partner with organizations who work to address Baltimore’s long history of segregation and unemployment. The BUWP prioritizes projects that work to build social capital and that invest in collaboration rather than investing in huge capital projects. These types of projects help neighborhoods become more sustainable. HumanIm, a nonprofit organization behind a unique job training opportunity involving the demolition of row houses in Baltimore. Understanding that the City was committed to demolishing a certain number of abandoned row houses in a certain amount of time, HumanIm approached the City to discuss the idea of deconstruction and repurposing of valuable and historic materials used to build the row houses. The City of Baltimore and the U.S. Forest Service put their support behind HumanIm. HumanIm’s deconstruction social enterprise, DETAILS, has been hugely successful as a means for job training for Baltimore residents who are coming out of the criminal justice system and are in need of skills and job training. The patterns recommended in the Green Pattern Book are being considered for lots all over Baltimore through the Green Pattern Registry. This registry was designed by Baltimore Neighborhood Indicators Alliance. To date, approximately 964 lots have been mapped as Community Managed Open Spaces, and 242 lots have been mapped as Stormwater Management sites. The Baltimore City “Growing Green Initiative” recently hosted a design competition, funded by the city of Baltimore and the US EPA, for community groups and designers who were challenged to use the Green Pattern Book to develop creative greening projects for vacant land in their communities as well as reduce and treat stormwater runoff. In 2014 seven organizations won the design competition. $300,000 was awarded to help these organizations with fully designing their projects and implementing them. Parks & People engages communities in the creation of green spaces on formerly abandoned lots. They focus on removing impermeable surfaces, creating rain gardens, creating edible gardens, and helping install green infrastructure improvements. The Baltimore Urban Waters Partnership (BUWP) works to develop projects devoted to protecting and restoring urban waters; promoting community revitalization and strengthening the social fabric through the removal of blight, establishment of open spaces, and creation of economic development to serve as catalyst opportunities for disadvantaged neighborhoods, and capitalize on the social and economic benefits derived from improved urban waters and adjacent lands. SavATree provides project support to the U.S. Forest Service Northern Research Station; a key partner in the BUWP. They also facilitate linkages between BUWP and other agency efforts in Baltimore. Mike Galvin, Director of SavATree is the Baltimore Urban Waters Ambassador/ Project Manager. Jonathan D. Essoka. EPA Region 3.